» Recover passwords from 108 installed software programs, including such popular programs as Mozilla Firefox, MSN Messenger, Microsoft Outlook, etc. Here is the full list of supported programs. » As additional feature retrieves usernames, and any other related information if available. » Export recovered data to Text file, HTML, Word, Excel, PDF, CSV, XML or tab separated files. » Scan remote network computer without installing anything on remote PC. » Scan all network computers. You can enter IP range, list of IPs or just list of computer names (useful for those who're using DHCP server). » Recover Passwords can scan multiple remote PCs at the same time; this will save you a lot of time. » Nice looking intuitive user interface, but with solid amount of options. » Easy customizable and nice looking printing. » Free and friendly technical support. We add any possible software to Recover Passwords at your request. » Working on Windows NT / 2000 / XP / Vista / Windows 7 and available in 12 languages. 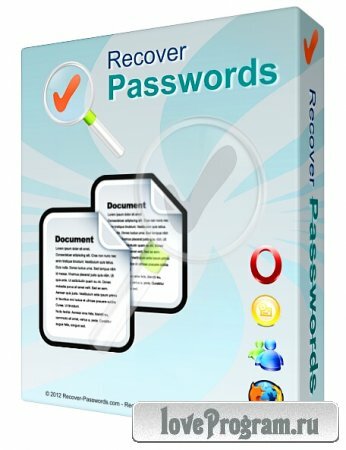 Вы просматриваете программу Recover Passwords 1.0.0.19 Portable, чтобы полноценно пользоваться всеми функциями сайта советуем Вам зарегистрироваться или войти под своим ником.